LAHORE: (Thursday, April 4, 2019): Federal Parliamentary Secretary for Climate Change Ms Rukhsana Naveed has said that Youth of Pakistan has to play key role in converting Pakistan into a state where quality of life of each individual is improved. She was addressing a graduation ceremony held at Punjab University Institute of Quality & Technology Management. PU Vice Chancellor Prof Niaz Ahmad, Registrar Dr Muhammad Khalid Khan, IQTM Director Dr Usman Awan, Acting Controller of Examination Muhammad Rauf Nawaz, faculty members and a large number of students were present on the occasion. 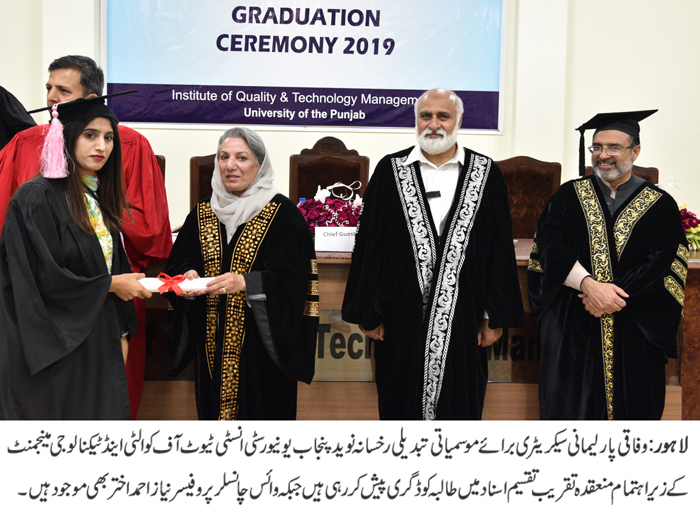 Addressing the ceremony, Ms Rukhsana Naveed said that all subjects taught at the university level should have relevance with the socioeconomic improvement of the country. She said that at present we were facing challenge of climate change and TQM principle of continuous improvement was the only way to address this problem. She congratulated the graduates and their parents at the occasion. Addressing the ceremony, Prof Niaz Ahmad said that our graduates had to apply their knowledge effectively at their workplaces. He said that it was the application of skills at workplace which make the graduates worthy. He said that in today’s global economy, no organization could progress unless it did not focus on quality of its products and services. In his welcome address, IQTM Director Dr Muhammad Usman Awan mentioned that graduates of this institute were playing significant role as industrial engineers and total quality management experts in the manufacturing and service sector of the country. He stated that the institute intended to be the regional hub of industrial engineering and total quality management research. Degrees and Medals were awarded to the graduates of B.Sc Engg. Industrial Engineering & Management, M.Sc. Quality & Performance Management, MS Total Quality Management and MS Industrial Engineering & Management.